Surely, everyone knows the value of having a watch. It is a convenient way to be able to tell the time whenever you need to. In a world where time is money, this is an essential device to possess. Some people may buy the first watch they come upon, or just any watch. While this may do the job, perhaps you should consider some reasons to buy a nice, quality watch. While getting any old watch can be useful, it says little about you. It’s important that your style expresses who you are as an individual. Your clothes and your accessories communicate to people your tastes and values. Buying a nice watch that fits your personality can help you to express your own uniqueness. Whenever you are having a conversation with someone, you might notice that a lot of hand gestures are used by all the parties within the conversation. These gestures draw the attention of the other people in the conversation straight to the hands. Connected to the hands, are the wrists, and one of those wrists can have a nice watch. This will definitely have all eyes on you and your watch. Everybody loves to be surrounded by beauty. People find their spouses by first being attracted to that person physically. People also have gardens to make their yards look beautiful, and decorate their houses for Christmas and Halloween. This is why we buy nice clothes, because we want to be a part of all the beauty that surrounds us. A nice watch serves as serious eye candy. They are fashionable, sleek, and classy, and they can dress up any outfit you have. Timepieces not only act as accessories, but make great heirlooms. Though you may not be thinking of such a time when someone will need a possession to remember you by, it is a good idea to consider. People can certainly live on through the memories of those who knew them. Passing on a timepiece you love allows the people you love to think of you when they use it. While you can buy any watch you want, we all value nice things. You can buy a nice watch to add to your closet from Finest Watches. Buying a new watch can be a thrilling process, especially if you love accessorizing. 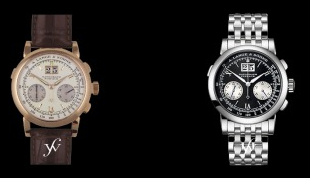 With so many different choices in styles, choosing the right watch may prove to be difficult. On the other hand, you may have already seen the watch you think is best for you. Whether you have a hard time picking, or are tempted to buy the best looking watch in the first store you encounter, considering these factors may prove to be useful. 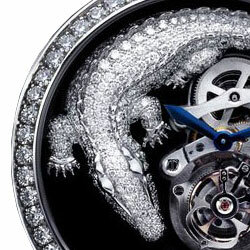 Watches can range from $10 to $1,000,000. Knowing how much you are willing to spend can help you decide on a watch. 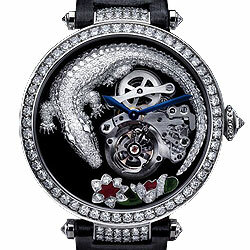 It is also important to remember that although expensive watches are beautiful, not every beautiful watch is expensive. 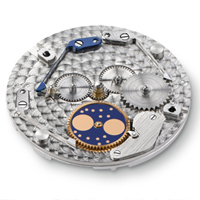 The movement of a watch refers to the design of the watch’s inner working, or how time is kept with the device. Common movements include digital, automatic, quartz, kinetic, or hand wound. Hand wound is the least common as it requires constant maintenance. Digital are electronic and often don’t have moving parts. Quartz is second to digital in accuracy. Though automatic and kinetic tend to be inaccurate, a higher quality moment will allow for a more accurate watch. There are two types of displays. The first and most common are called analog watches. This means that it has moving hands to show you the time. The second type is digital watches. These types of watches show the time using numbers displayed on a screen rather than hands. 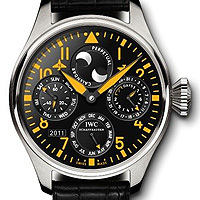 This type is powered by an electronic chip inside the timepiece. The material covering the face of the watch is called the crystal. They are made from a variety of materials depending on the brand and style of watch. For example, many digital watches have plastic based crystals and many analog ones have mineral glass-based crystals. All materials used have varying degrees of hardness and some are more scratch resistant than others. When buying a watch, you will notice they come in many different materials. Pieces are commonly made form stainless steel, gold, titanium or silver. Though a watch may be advertised as valuable due to its material, the real value of a watch lies within the quality of movement. Therefore, do not let the material of the watch be the leading factor in your decision to buy it. Do not rely much on the band of a watch when thinking of buying it, as this is the most easily changed feature. Also, the band has little to do with the value of the watch, just like the material it is made from. If you plan to use the watch in all sort of scenarios, including wet conditions, a metal or synthetic material is a better choice because leather or micro fiber bands do not respond well to water. These few factors are important when choosing the best watch for you, or even as a gift to others. If you are looking for purchase quality watches, then you should check the variety of watches offer by Finest Watches. A watch is a wonderful gift to get for any special man in your life. Your boyfriend, husband, father, and even grandfather will certainly appreciate a nice wristwatch. After all, a man’s watch says a lot about him. Here are a few tips to help you find the right one. Before setting out to search for a watch, you should know what your budget is, and what falls under that budget. Least costly watches are about $60 to $200. 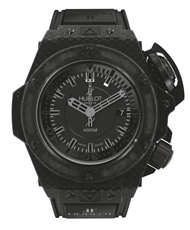 These include watches with plastic and resin composites or fashion and sport watches. More costly ones are around $300 to $700. These would include stainless steel, leather, titanium and carbon fiber. The most costly ones are $1000 or more and are formal and designers watches. They are also mechanical watches and utilize precious metals for certain features, such as gold-plated or a platinum piece. Each style of watch comes along with a set of basic rules. Dress or classic watches should be made of gold material, have a plain thin case, and thick markings and hands with lots of tritium. Designer watches should be designed by someone with a world-wide reputation. These watches may sometimes look unusual. Lastly, sports watches are usually large, have bezels with prominent markings, are water resistant to some degree, and generally have thick, luminous hands and markings. Before purchasing, you should learn some facts about the watch manufacturer’s reputation. You can do your own research by going online or asking friends or relatives who already own the specific brand you are interested in. 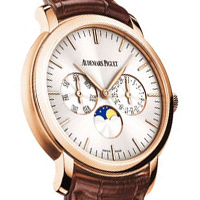 The most prestigious watch brands are available only in authorized retailers. 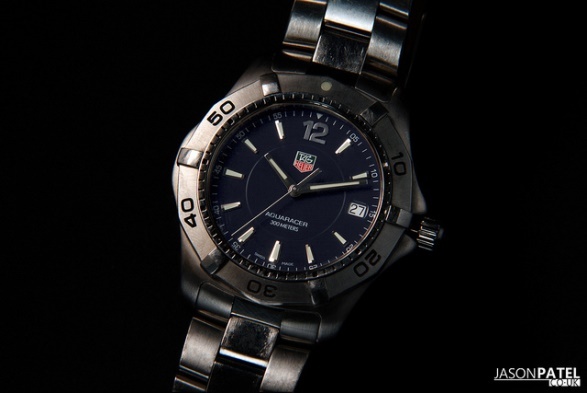 You can use an internet watch catalogue to choose watches you would like to buy. You can also go to the retailer’s official shop for details and the prices of a watch. The size of a watch has a lot to do with your body structure. If you have a larger structure, you may want to choose watches with large faces. If you have a smaller structure, beware of how larger watches might look on your wrist. A watch that is 100 meters deep water resistant will save your watches if they are worn during a workout or if you are caught in a rainstorm. Stainless steel will last longer than leather. The life of mechanical watches can be almost infinite. Any man in your life will be grateful for the gift of a watch, especially when so much thought is put into buying the right one. Purchase a watch from Finest Watches to show him just how special his is to you. 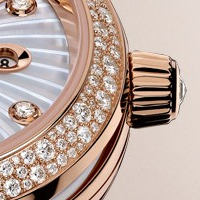 Luxury timepiece maker Omega has recently re-introduced its Ladymatic collection of watches. The line was originally launched back in 1955 as part of the brands De Ville collection. 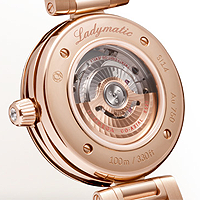 The Ladymatic was one of Omega's first self-winding watches that was designed especially for women, and it featured the smallest automatic movement the brand had ever made. The launch celebration was held at the Ritz-Carlton Hotel in Beijing and was attending by the Oscar-winning actress and brand ambassador, Nicole Kidman. 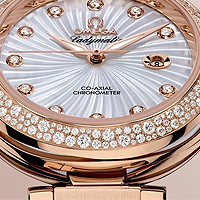 The Omega De Ville Ladymatic timepiece has a round 34 millimeter wave pattern case crafted in 18 carat red gold, yellow gold or stainless steel with a polished or a snow-set diamond-studded bezel. 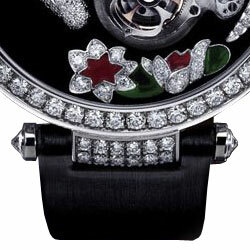 The polished screw-in crown is encrusted with an Omega Cut diamond or a polished Omega logo on the non-diamond version. The case-back is polished and fitted with a see-through case-back crafted from sapphire crystal, displaying the stunning movement. The dial is available in extra-white mother-of-pearl or lacquered black, each with a Supernova pattern. 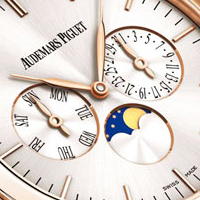 The dial features either 11 diamond indexes facetted in 18 carat gold mounts or a version with no hour-markers. 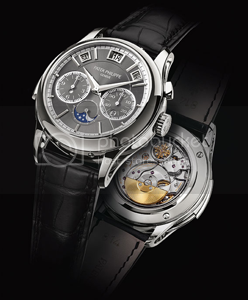 The timepiece is powered by the brands calibre 8520/8521 movement which incorporates a Co-Axial escapement. This caliber features the company’s exclusive Si 14 silicon balance spring which increases the level of its resistance to external shocks and environmental disturbances. The movement powers 4 functions, hours, minutes, seconds, and date. The hours, minutes and seconds are indicated by polished alpha-shaped hands treated with Super-LumiNova for heightened readability. The date indication is located in an exhibition window at 3 o’clock. An impressive 27 variations will be available. 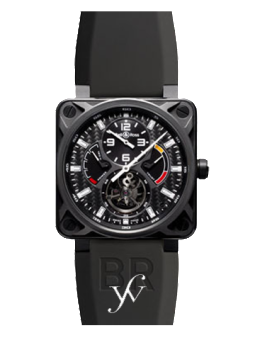 Franc Vila has announced their official sponsorship of young Mexican F1 diver, Sergio Perez, and has released the Franc Vila FVa8Ch Bicentenario Sergio Perez watch to mark the new partnership. 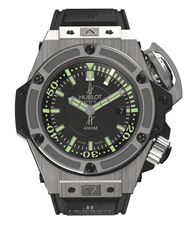 This new watch will be giving the official timepiece maker of the compatition, Hublot, some steep compition at the next F1 event. The watch is also a celebration of the 200 year anniversary of Mexican independence, this can be seen in the watches design which incorporates the colors from the Mexican flag into the design. 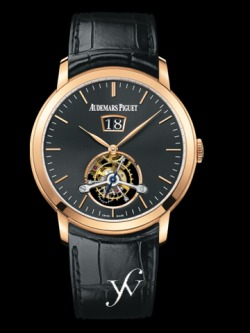 The watch is a limited edition of just 28 pieces. 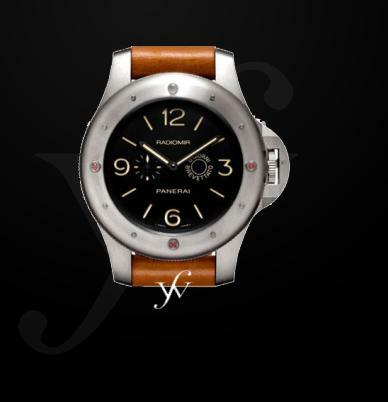 The new Franc Vila watch is powered by the automatic manually-finished movement, Caliber FV8Ch. 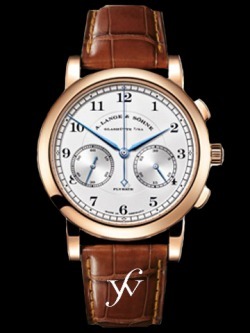 The complicated movement functions include hours, minutes and seconds as well chronograph functions and a "big date" calendar presented in a double window below 12 o'clock. 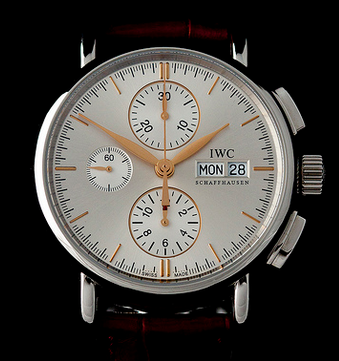 The chronograph minutes can be found at 6 o’clock, chronograph hours at 9 o’clock, and small seconds at 3 o’clock. 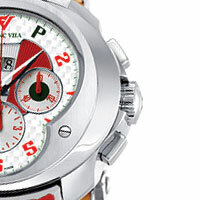 The FVa8Ch Bicentenario Sergio Perez allows for a power-reserve of up to 42 hours. The case is crafted from stainless steel and features the “Esprit Unique” shape with an elliptic bezel. The dial and case-back are protected with a sapphire crystal treated with a double anti-glare treatment. 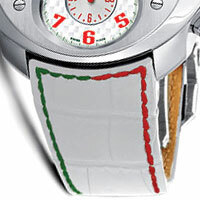 The dial is made from white kevlar and hs a guilloche pattern. 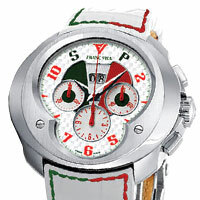 The Franc Vila FVa8Ch Bicentenario Sergio Perez watch is completed with a black or white crocodile leather strap with red and green stitching and a steel deployant buckle. The watch has a 100-meter water-resistance. 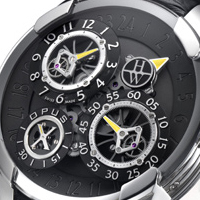 Harry Winston launched The Opus Series in 2001 each year since they have partnered with the industry’s best watch makers to create a new Opus that is both groundbreaking and beautiful. This year Harry Winston has partnered with watch engineer Jean-François Mojon and the collaboration brought about the OPUS 10. A timepiece inspired by planetary movements and the space-time continuum the watch uses shapes and the dimensionality of time through the synchronous rotation of circular motions. The Opus 10 strays from tradition with its innovative system of rotating indicators mounted on a revolving frame. The revolving frame rotates in one direction while the dials of each indicator turn in the opposite direction, this ensures that the orientation remains constant in any position. 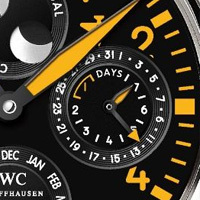 The hand-wound mechanical movement includes indicators for hours, minutes, seconds, and secondary time-zone, all set on the individual satellite wheels which orbit around the central, solar wheel. The movement allows for a 72-hour power reserve. The watch features a 46 millimeter case constructed from white gold and is designed without a bezel. The rounded sapphire crystal is attached directly to case. 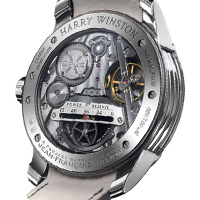 The case-back is marked with both Harry Winston's and watch engineer Jean-François Mojon's names. The reference 500/MMJFMWL.K is completed with a black alligator strap and an 18 carat white gold buckle. 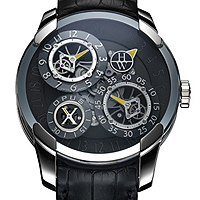 The Harry Winston Opus 10 is a limited edition of jut 100 pieces.